I finally used the University of Michigan library system! The undergraduate library is a really swanky library and has a browsing collection and just happens to be on my walk to the business school. I stopped in today and snatched up three books, all of which I've wanted to read for some time, so it was a very successful trip. 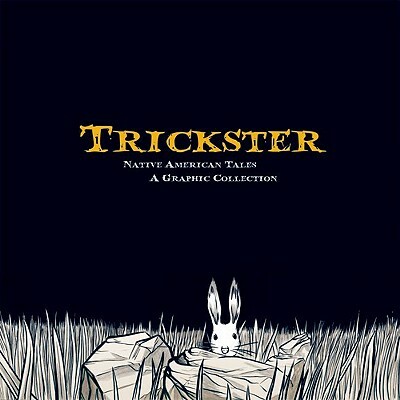 One of the books I got and immediately delved into was Trickster: Native American Tales - A Graphic Collection. I've wanted to read this book for quite a while, and was so thrilled to find it waiting for me at the library. (Isn't it awesome how libraries manage that?) Trickster is a compilation of many Native American folk tales, shared by storytellers of several different tribes and then put into the graphic novel format by artists the storytellers chose themselves. Some of the stories have morals, some explain natural occurrences, some teach lessons and some are just entertaining. Editor Matt Dembicki makes clear in his note that "the point wasn't to Westernize the stories for general consumption, but rather to provide an opportunity to experience authentic Native American stories, even if it sometimes meant clashing with Western vernacular." And I think this is important to know going in. Ever since reading Charles Mann's 1491, I have been depressed by the idea of the cultural knowledge and perspectives that the world lost when the Native Americans died so quickly after first contact with Europeans. And this book really brings that to the forefront. These stories are told with such unique voices and in manners so totally foreign to my upbringing. I don't want to group them all together, as I know the storytellers all come from different regions and have completely different cultures. So it's unfair for me to say that all the stories were equally foreign to me, but they really were and I don't think I'm at a place yet (or will ever be) from which I can differentiate the stories of one tribe from another. But I just wish we had more of these stories. 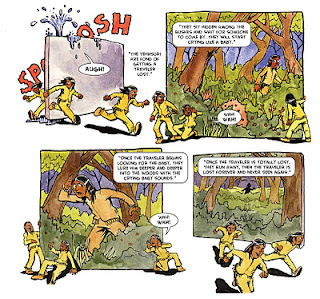 This book is a compilation of stories about Tricksters, so in many ways it reminded me of the African folk tales around the character of Anansi. This is not only because Anansi was a trickster, too, but because so many of those stories revolve around animals, and the interactions between different types of animals, and how they got to be that way. There aren't many people in these stories at all, which is such a huge difference than the way stories in Europe and Asia are written. I loved learning about how the alligator got his skin, the rabbit got his puff tail and why wolves howl at the moon in loneliness. I was disappointed in the supreme lack of female characters, however. I always struggle with this because in many historical tales, women are not the ones that go out and do things, but rather the ones that have things done to them. And I can't really blame storytellers for sharing stories that have been passed down for generations and that just happen to not include many women, or use women to show what happens if you raise a daughter that is "not chaste." There was one story with a female toad that really showcased her ingenuity and strength, and then there was a different story about how a woman who lied about her sexual history got a whole lot of people in trouble. It was difficult for me to come to terms with this, for obvious reasons. I struggle with really loving the historical perspective and outlook, and really hating the message itself. I admit that some of the stories really confused me - they seemed to end very abruptly, or with the "bad guy" winning or have all sorts of symbolism that I didn't understand. But at the same time, some stories just felt so universal, as though they are told in every culture, with just some slight variation in tone and characters and details. As usual with short story collections like this, I wanted more, and felt unsatisfied not to get anything else. There's also no context provided as to where the stories come from, which I missed. I'd love to know which culture keeps each story alive, the significance of the animals that populate them, and anything else that would be valuable. But really, we only get the story. If the goal was to pique interest, then my interest has been piqued and I'm really curious to learn more about Native American legends and myths and stories. I really liked that each story had such a distinct voice, not only in relating the words but also in the artistic style. No two stories were even close to being the same, and it really reiterated to me that while we lump Native Americans into one category of people, ethnically, they really are so different from each other, and it's disrespectful for us to ignore that. These stories highlight the many different ways they have of looking at the world, and I loved it. I'd really love to read a book about the creation myths of different cultures around the world, and how they compare to each other. I think that would be very interesting and enlightening! Does anyone have a suggestion? I am glad you mostly enjoyed this. I didn't love it, but I was glad to have read it and enjoyed some of the stories. I think it is like any short story collection, though. Some stories you really like and then some you don't as much. Yes, I didn't love the stories, but I really liked the concept of putting this collection together. 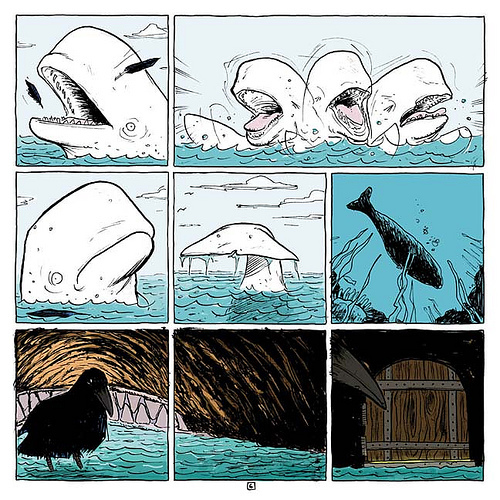 I seem to have that feeling a lot- I read a graphic novel about women scientists that created the same conflict in me, and I felt the same way about Y. S. Lee's The Agency book I read. I need to get my hands on this! I really like the samples of the art that you shared. 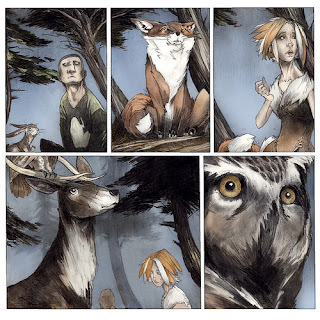 And I hear you on women's roles in (some) folklore and traditional stories. I don't resent the inclusion of these stories in modern anthologies, and I don't think the sexist wordview behind them means they should be erased from tradition. But I DO resent the fact that they seem to be the majority of the stories that are collected and which thus become more well-known. Traditional tales are not *all* about passive women (anthologies like Not One Damsel in Distress, edited by Jane Yolen, or Angela Carter's The Virago Book of Fairy Tales, or Fearless Girls, Wise Women & Beloved Sisters, are good reminders of that), and yet to this day many editors seem to repeatedly privilege the ones that are. I understand what you mean about struggling with the abruptness of the endings in some of these tales; I haven't read this particular collection (though it's now on my list!) but I've faced that challenge with Anansi tales myself. It's such a contrast to the tales with which I'm more familiar, but I think I'm adjusting slowly. As for creation tales, I haven't read this one, but it's the one that I'm eyeing: Virginia Hamilton's collection, In the Beginning. I love her story-telling and have leafed through this one in the library recently and added it to my list accordingly! This looks right up my alley of current reading topic interests. I'm going to have to get my hands on a copy. Yes, folk tales are so fun! 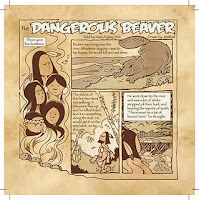 I've had a book on my shelf forever called Giving Birth to Thunder, Sleeping With His Daughter, which is a collection of Coyote stories from various Native American traditions. I haven't read it yet, though, because I do find that I often have a hard time parsing the meaning of those folk tales. The sense of cause-and-effect is very different than in more familiar Western morality tales. Yes, you're spot on! 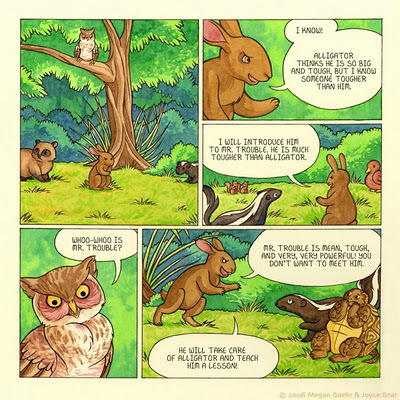 There is a very different understanding of consequences in this book than I can really understand. It was fascinating and a little unsettling, which I really liked. Aw, bummer :-( I have a lot of them reviewed in February, unfortunately! oh wow, this sounds totally unexpected and eclectic! I love that you delved into how the stories made you feel as a reader and as someone who hasn't had a lot of experience with this type of story before. I think it would be really interesting to see what I think of this one, and I am going to have to see if I can find it. This was just a stunning review today. Aw, thanks, Heather :-) I hope you are feeling better soon! That said, the blogged book does sound like one of those that are better in theory than execution but still an interesting read. And some of the titles in the comments are now in my Later List. Haha, because you LOVE reading books to relax, Carrie! Yes, I would love to chat with you about it when you're done!